April | 2015 | And Baby B Makes Three! I went to the orthopedic surgeon last Thursday, and had my x-rays done (nearly five weeks post running accident). The break in my foot is healing well, but the ankle break still has a gap where the bone hasn’t come back together yet. 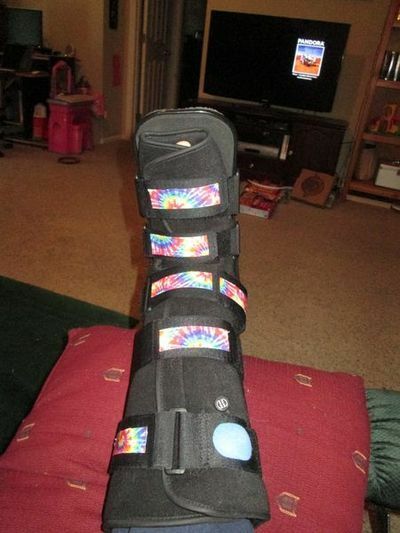 He sees signs of healing, though, so he said I can start transitioning to weight-bearing gradually as my foot allows, remaining in the boot for another month to protect the foot as I add weight. 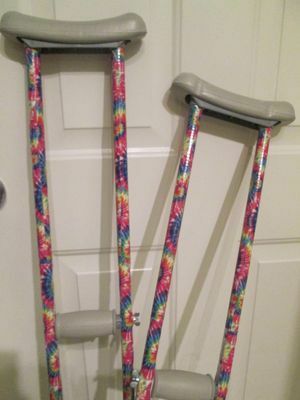 So I’ll still be using the crutches to help me get around for a little while longer, but hopefully I’ll ditch those in the near future and can return to more of a regular daily routine. I’ll also need to get some physical therapy started (waiting to hear back from the ortho office about a question first), aiming for twice a week for that. All in all, it’s about what I expected. I go back on May 22 for another set of x-rays to see how things are progressing. Once upon a time, I knew how to play chess. That was many, many moons ago, and to say my knowledge of the game now is rusty would be very generous. I wasn’t a chess whiz, by any means, but I do have fond memories of teaching myself how how play (via a computer game we had on floppy disk) and then challenging my dad to games. That phase didn’t last long, but I remember being so proud of myself for learning it on my own. 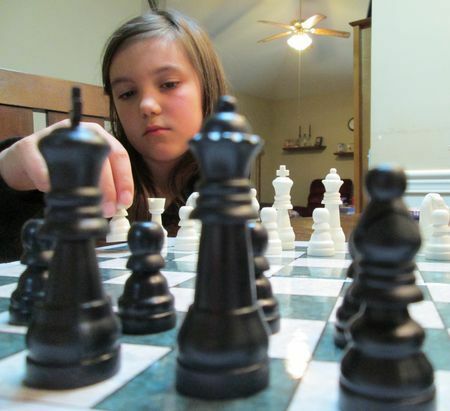 Recently The Big Sis started taking an interest in chess. She’d gotten a set for her birthday, but she actually ended up learning at her after-school program. She kept talking about it so much that I asked her over the weekend if she’d teach me how to play. We have “No Stress Chess,” which is a great system for teaching beginners, so she took on the role of teacher to educate me about the game. It quickly became clear just how much of a novice I am when I tried to move one of my pieces to attack another, and she looked at me for a few seconds and then said, “You’re trying to attack your own piece.” Hahaha! We got a big laugh out of that one! But on a more serious note, it was interesting to be in a position where she had this wealth of knowledge that she was trying to pass on to me. She did very well explaining moves and rules to me, and maintained quite a bit of patience as I asked question after question about possible moves and strategy. She was even sneaky with me a few times during our practice game and would say, “I don’t care of you capture my [piece],” and so that’s the move I’d make, but then that would just set HER up for a better move. Chess is all about strategy and thinking many moves ahead, but I didn’t think she’d caught on to that part of the game that proficiently. That’ll show me, I guess! I am not a crafty person. At all. I’m just not good at it. It’s stressful to me. I’m never happy with how anything turns out. I despise the mess it makes. I don’t have the patience for it. In fact, I’ve always joked that half the reason we sent the girls to daycare is so they could learn how to do art projects there, and I wouldn’t have to do it here. Somehow, over the past year or so, mostly on her own, The Big Sis has gained the desire to turn what I call trash (though it’s really recycling) into artwork. She’s made a haunted house and a huge mailbox, among many other things, with her rescued boxes and other items. This baffles me greatly, as this is the kind of art project I am the most terrible at: turning trash into treasure. But she likes it, and I try to encourage it (while trying to keep her from bringing home OTHER PEOPLE’S TRASH, which she has done before. Multiple times.). 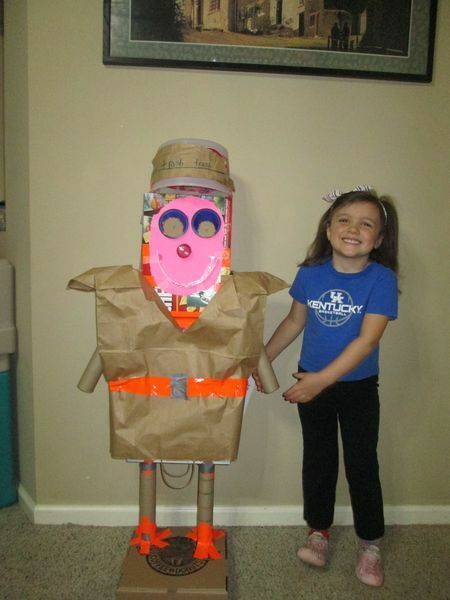 A few weeks ago, The Little Sis had a “homework” assignment for daycare: make a garbage monster as a family project. Thankfully, I knew we had a resident trash art expert among us, so we consulted The Big Sis, who helped The Little Sis plan out how this garbage monster would take shape. The Husband did most of the actual work putting it together late last week, but I cheered him on from the recliner. I think it turned out looking really good, and The Little Sis was on cloud 9 when it was time to take it to daycare, The Husband said. 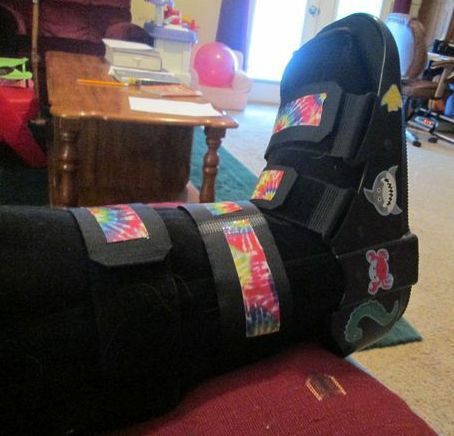 Hey, no one said I had to be unstylish when wearing a cast boot and using crutches! While having a broken ankle and foot is quite a pain in the, well, foot, there are some positives to the situation. It was a silly accident that has created a major annoyance, but it certainly could have been worse. *At least I’m not in a traditional cast. I can remove it to sleep, if I wish (though most of the time I leave it on), and I can remove it to shower, thank goodness. Also, I can remove it temporarily if it’s just feeling uncomfortable. 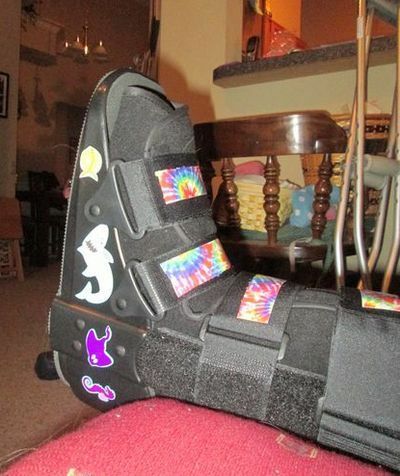 *At least I’m not in a cast boot in the summertime. *Having a cast is practically a prescription for watching Netflix as much as possible. *All yoga pants, all the time! *I get a one-month pass to get out of doing dishes! Now, all that being said, I don’t want to underplay this. It really is quite a challenge. Nearly all household and parenting duties have been shifted to The Husband, which puts a lot on him and is incredibly stressful for him (well, and for all of us). I have a very hard time asking for help on a good day, but I have to do it constantly now, and we don’t really have much local help, so that puts even more onto The Husband’s shoulders. I definitely commend him for all he’s doing, as it’s quite a bit (but also secretly hope he understands better how much “behind-the-scenes” types of things I do on a daily basis). I never realized how many things I do each day that I simply took for granted that I could do it pain-free. Putting on pants. Getting into the shower. Picking up things that fell on the floor. Going to grab some water. Putting in a DVD. Laying on my side in bed. Answering the front door. Making lunch for myself. But, again, this is all temporary for me, and I appreciate THAT most of all. Serenity and I woke up on Sunday morning (March 8), and I can’t speak for her, but I felt pretty beat up, sleep-deprived, and I had multiple blisters on my feet from walking all over NYC with my snow boots. But we had a date that day with a pizza tour bus, and nothing was going to stop us from that. First things first, we went to the bagel shop for a bagel fix, and I also grabbed some bagels to take home to The Husband (and also The Girls, but mostly him). We got ready, then walked to Lombardi’s Pizza in Little Italy, which was our tour meetup point at 11 a.m. Scott of Scott’s Pizza Tours greeted us, got everyone checked in, and we began the tour, which included four pizzerias throughout the boroughs, not just in Manhattan. Lombardi’s was the first one, then via school bus we ventured over to Best Pizza in Williamsburg (Brooklyn), then up to Queens for Dani’s House of Pizza and John’s Pizzeria. We were given pizza journals to help us take notes about the pizza and help us discern the differences in styles. One of the things I loved about this tour was the fact that it allowed us to venture out to other areas that we certainly wouldn’t have hit otherwise. Of the ones we tried, I liked Lombardi’s the best, though John’s Pizzeria (not the same as John’s of Bleeker St.) was a pretty close second for me, though it was definitely a different style. By the end, we were stuffed, but that served as both our lunch and dinner, so it worked out well. Scott the tour guide was Awesome with a Capital A. He eats, sleeps, and breathes pizza, so he knows his subject well. (He says he has a self-imposed 15-slice limit per week.) His passion, enthusiasm, and knowledge of pizza are obvious and infectious. If anyone comes away from this tour unsatisfied, I’d be shocked, and I will recommend it for tourists and locals alike. The tour ended at exactly 3:30 p.m., so we walked back to the apartment, grabbed Serenity’s car and our suitcases, then she drove me to the airport for my 6:30 p.m. flight home. That ended up being delayed about 45 minutes or an hour as we waited for our plane to arrive, but I’ve had worse solo return trips, so no complaints. I was still just feeling fortunate I’d even made it there in the first place! You are currently browsing the And Baby B Makes Three! blog archives for April, 2015.